The Wibbley Wobbley was a pub situated inside a boat moored in Greenland Dock on the east side of the Rotherhithe peninsula. According to the Southwark News, it was closed by 2015. Advertising itself as "England's only floating pub", the Wibbley Wobbley is a pub situated inside a boat moored in Greenland Dock on the east side of the Rotherhithe peninsula. It's a little cramped inside near the bar, though there's more room further back than you might expect. A floating pontoon attached to the side of the boat provides external seating space, which is quite nice on a sunny day (though note it's rather more wobbly than the boat itself). Kake and doop visited on a Sunday Bank Holiday afternoon in May 2008. No cask ales, but they did have Old Speckled Hen on tap (£2.80/pint). They also had other standard pub fizz including Strongbow. There were a fair few other customers, most of them enjoying the weather outside on the pontoon, but we managed to get a table out there too. Kake visited again on a Wednesday evening in October 2008. It was pretty much empty apart from a regular at the bar, a couple in a corner, and three young men unwinding after work. No piped music. Strongbow was £1.40/half. They were doing food during our May 2008 visit, including "roast rib of beef with Yorkshire pudding and all the veggies" (£9.50) and "goats cheese, thyme and red onion tart with proper veggie gravy, asparagus and new potatoes" (£8.50) (photo of that day's menu); not sure whether food is served throughout the week. 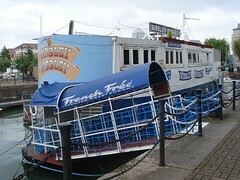 Signage on the boat indicates that there's a restaurant upstairs called French Fred's, but the BITE comments linked below suggest that this is no longer actually in existence as a separate concern (and we didn't check). Accessibility: Fairly steep set of steps down to get in, with very low handrail. Toilets are minuscule, with heavy enough doors that Kake momentarily thought she was locked in. Getting here: The map link on this page is accurate; note that many online maps have the pointer in the wrong place (the centre of the postcode). Last visited by Kake, October 2008. Last edited 2016-02-23 14:03:28 (version 10; diff). List all versions. Page last edited 2016-02-23 14:03:28 (version 10).